Wilfried Bony is sidelined for a third game in a row, while Renato Sanches and Kyle Bartley will also miss out for the home side. Paul Clement may look to make changes to his usual XI in order to keep players fresh for this weekend’s league match away to Arsenal, but this is a real opportunity to knock Manchester United out. Roque Mesa has started three games all season since joining Swansea over the summer but should get a rare opportunity to impress against United. Manchester United manager Jose Mourinho would ideally like to shuffle his pack here against Swansea with an eye on next weekend’s league game against Tottenham, but injuries will limit his options. Phil Jones has added to Mourinho’s problems after pulling up with a muscle injury in Saturday’s shock 2-1 defeat to Huddersfield. With Eric Bailly also set to miss out, Victor Lindelof may have to start despite a dreadful performance at the weekend. Luke Shaw has not got a look in since recovering from injury earlier this season but will be hoping to get some game time at the Liberty Stadium. 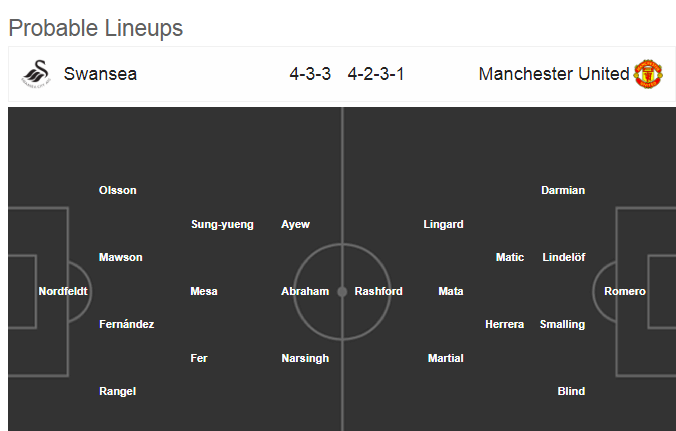 Paul Pogba, Marcos Rojo, Michael Carrick, Marouane Fellaini and Zlatan Ibrahimovic are all sidelined for the away side. Nemanja Matic could do with a rest but Mourinho may have no other choice but to start the Serbian unless Axel Tuanzebe is given a chance and moved into midfield. Swansea have lost three of their last four and are only outside the bottom three on goal difference in the Premier League. At home, Paul Clement’s side have lost four of their first five matches. Manchester United have lost all momentum since domestic football resumed after October’s international break. Saturday’s defeat against Huddersfield was arguably the worst performance of Jose Mourinho’s tenure. Mourinho will demand an immediate response from his players but fatigue looks to be an issue in the squad with injuries starting to build. The United boss has enjoyed some of his biggest wins in English football against Swansea but a hard fought game is anticipated on Tuesday. 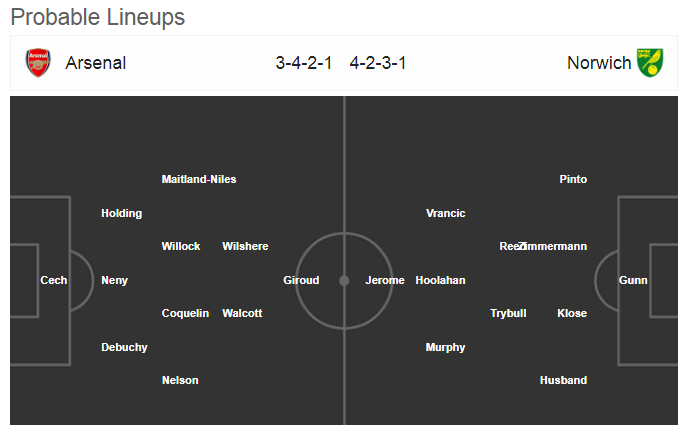 Arsene Wenger will make changes to the side that faces Norwich on Tuesday given they only played Everton on Sunday. The Arsenal XI against Championship side Norwich will look similar to the teams that Arsene Wenger has deployed in the Europa League this season. Jack Wilshere, Mathieu Debuchy Olivier Giroud, Theo Walcott and Alex Iwobi will all start here. With David Ospina sidelined through injury, Wenger must decide between sticking with Petr Cech or turning to one of the club’s youngsters. Marley Watkins serves the final game of his three-match ban against Arsenal, while Norwich will also be without at least six players through injury. Norwich manager Daniel Farke is expected to make some changes in order to keep the squad fresh but the bulk of his usual XI should get the chance to test themselves against Arsenal. Arsenal have won eight of their last 10 competitive matches. They are at the end of a run of three games in five days and there will be some tired legs in the squad. Norwich are unbeaten in nine matches and will travel to the Emirates huge on confidence and with nothing to lose. The Championship side have got on the scoresheet in four of their last five matches away to Arsenal, which should only give them more belief ahead of Tuesday’s match. However, Arsene Wenger’s side are favourites for a reason and should come advance to the next round of the competition.